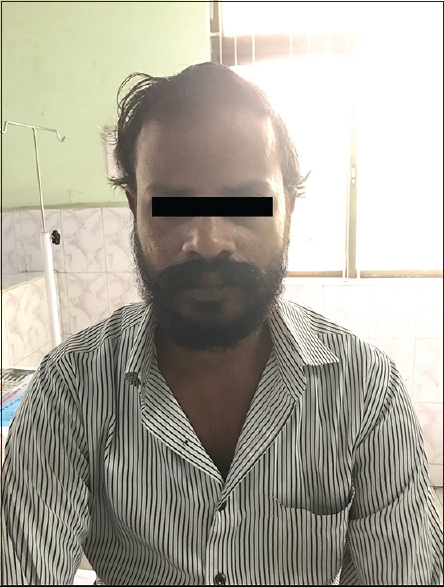 The following case reports of a young male, a chronic alcoholic and smoker, who presented with an episode of severe headache and was admitted to emergency department in a tertiary care hospital. Clinical examination showed patient to have bilateral papilledema. Further investigations showed cerebral venous sinus thrombosis and polycythemia vera. This case report emphasizes the importance of a thorough ophthalmic and neurological evaluation along with relevant biochemical investigations in patients presenting with a history of acute or persistent headache. Cerebral venous sinus thrombosis (CVST) is a condition of diverse clinical manifestations and presentations. This condition is a common differential diagnosis for any unexplained central nervous system (CNS) disorder due to its high degree of the clinical suspect. It can arise de novo or can overlap other clinical features. The incidence is more common nowadays, and it commonly affects women more than men, especially during pregnancy. Risk factors include infection, trauma, pregnancy, drugs, procoagulant states, diabetes, and dehydration. Due to the heterogeneity of presentation and etiology, diagnosis is often missed. Polycythemia vera is a chronic, progressive myeloproliferative neoplasm characterized by an elevation of red blood cells (RBCs). CVST is associated with many hypercoagulable states including polycythemia vera. It is slightly more commonly seen in men than women. Risk factors include Janus kinase-2 gene mutation, age, and exposure to radiation and toxic substances. Presentation and manifestations can vary and are often due to increase in blood volume and thrombotic complications. Studies show 50%–80% of patients present with neurological problems. 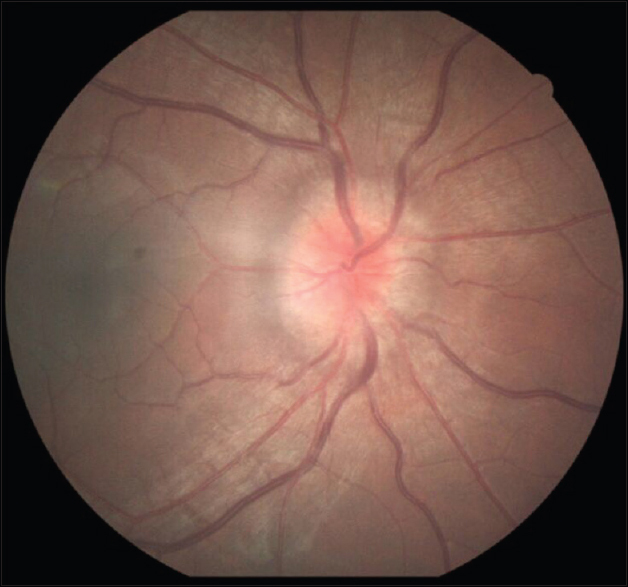 Papilledema is a condition of optic disc swelling that is secondary to elevated intracranial pressure. Usually, it presents bilaterally and can be asymptomatic or present with headache. Papilledema occurs due to the transmission of increased pressure asymmetrically from the subarachnoid space into the optic nerve sheath. The following case reports of a chronic alcoholic diagnosed with polycythemia vera after presenting with CVST and bilateral papilledema. 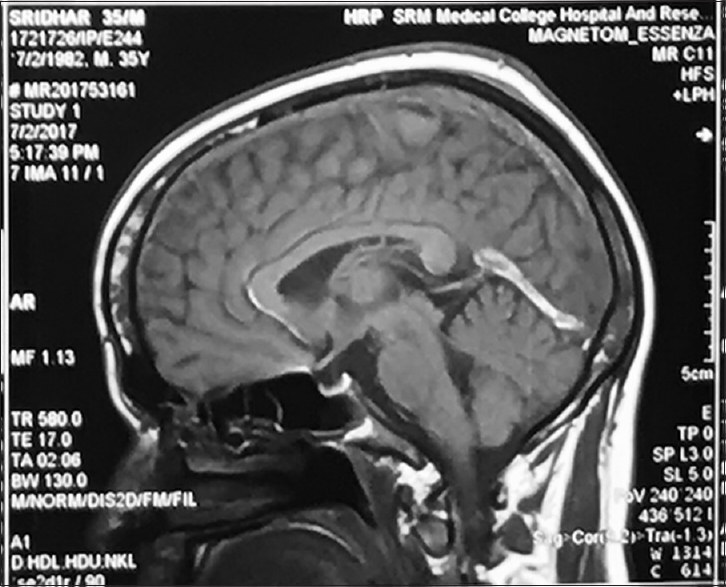 A 35-year-old male [Figure 1] was admitted to emergency department presenting with an episode of severe headache. He was a driver by occupation, chronic alcoholic and smoker for the past decade, normotensive, nondiabetic with a mixed diet intake, and no previous exposure to radiation. The patient was apparently healthy 10 days ago but developed a sudden severe bitemporal and suboccipital headache. It was continuous with no aggravating or relieving factors. Associated symptoms included neck pain, tinnitus, bilateral ear block, and a low-grade fever from the morning with no history of chills. There was no history of trauma, visual disturbances, limb weakness, urinary disturbance, seizures, nausea, vomiting, or any other complaints. The patient had a history of similar complaints 3 months back, for which nonsteroidal anti-inflammatory drugs were given. There is no history of any systemic diseases or infections. On clinical examination, the patient was conscious, oriented, cooperative, comfortable, and afebrile. Heart rate was 86 beats/min with normal rhythm and volume. Blood pressure was 126/86 mmHg. Respiratory rate was 12 breaths/min. Temperature was 38.2°C. No other significant findings were seen. Examination of CNS showed no focal neurological deficit and presence of neck stiffness. Clinical examinations of other systems were normal. His ophthalmic examinations were done [Table 1]. Examination of fundus showed papilledema in both eyes. 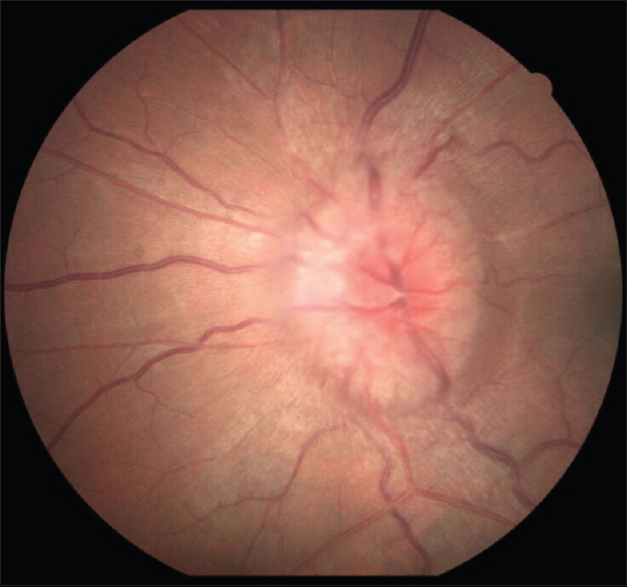 The right eye showed mild optic disc edema, and the vessels in the retinal background appeared normal [Figure 2]. The left eye showed marked optic disc edema with blurred disc margins, the vessels over the disc appeared tortuous and vessels in retinal background appeared normal [Figure 3]. 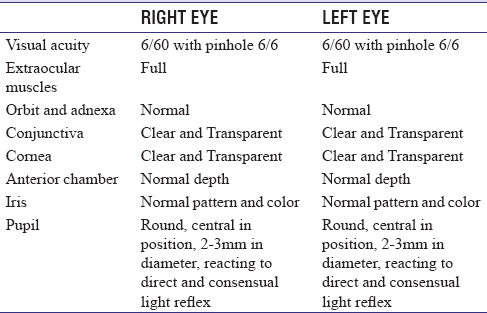 According to the Modified Frisén Scale, the impression is Grade 1 or mild papilledema in the right eye and marked or Grade 2 papilledema in the left eye [Table 2]. 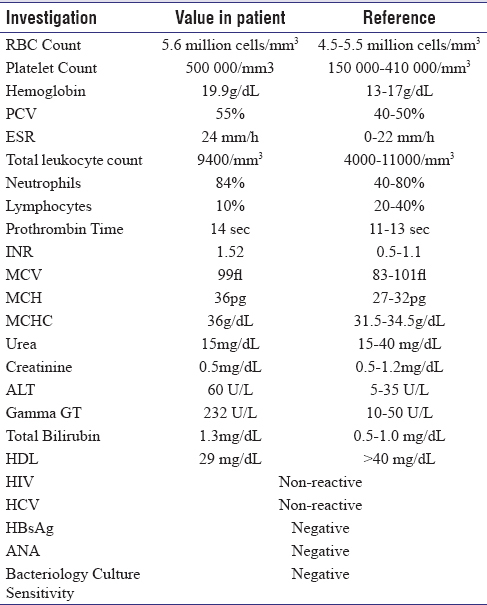 The biochemical investigations of the patient showed an increase in RBC count, platelet count, hemoglobin, packed cell volume, neutrophil count, alanine aminotransferase – gamma, prothrombin time, and international normalized ratio. The details of patient and reference values are presented in [Table 3]. Peripheral smear showed packed normochromic macrocytic RBCs, increased erythrocyte overlapping, and myelofibrotic teardrop cells, confirming polycythemia vera [Table 4]. An increase in the blood viscosity was demonstrated with an increased erythrocyte sedimentation rate. Other investigations such as electrocardiogram, chest X-ray, and ultrasound of abdomen were normal. Computed tomography (CT) – brain plain study showed prominence of transverse sinus with hyperdensity of the left occipital region [Figure 4]. 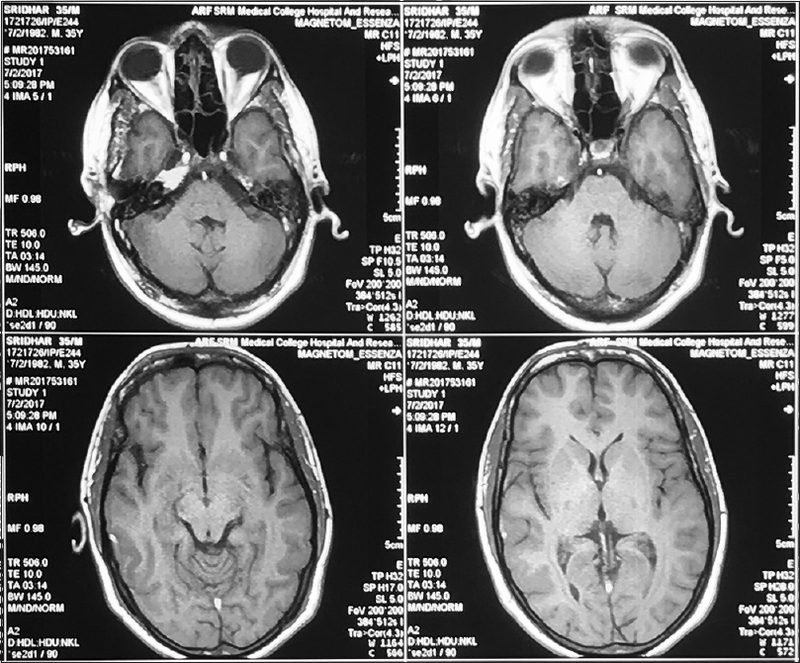 Magnetic resonance imaging (MRI) with magnetic resonance venography (MRV) [Figure 5] showed thrombus involving internal cerebral veins, veins of Galen, straight sinus, superior sagittal sinus, bilateral transverse and sigmoid sinuses, and superficial cortical veins over the right tempero-parieto-occipital lobe – an overall impression of cortical venous sinus thrombosis. CVST is mostly seen in the sagittal sinus (71%) more often than any other dural venous sinuses because of its high position, low pressure, and slow flow. The papilledema is usually bilateral and symmetrical; however, it may be unilateral and asymmetric in rare cases. The visual sensory function is usually not affected unless macular hemorrhage and exudates or papilledema become chronic. In aseptic thrombosis due to polycythemia vera, the raised intracranial pressure usually results from occlusion of the superior sagittal sinus producing the symptoms of papilledema, which results from impaired cerebrospinal fluid absorption and consequent elevation of intracranial pressure. CT scan and MRI imaging are used to diagnose cerebral sinus thrombosis. On noncontrast CT scan, a thrombosis is visualized as a linear area of hyperdensity. MRI and MRV may demonstrate acute thrombosis and lack of blood flow in involved sinus. In a patient with polycythemia vera, the management involves the maintenance of normal hematocrit level and correction of raised intracranial pressure. Periodic phlebotomies can be done to prevent thrombotic complications to manage hematocrit level. Hydroxyurea or interferon-α or anagrelide can be given to control thrombocytosis. Visual prognosis in patients with papilledema-treated medically or surgically is generally good. The patient was treated with low-molecular-weight heparin. A retrospective review by the International study on the cerebral vein and dural sinus thrombosis also showed no significant but definite trend toward improvement with anticoagulants. After 1 week of admission, the patient was discharged from the hospital. He was advised lifestyle modification apart from medication such as refraining from alcohol and smoking to prevent recurrence of CVST and papilledema. Follow-up was done 1-month later, and the patient was symptomatically better with no further episodes of headaches and regression of papilledema was seen. Special screening for occult prothrombotic entities in young patients presenting with cortical venous sinus thrombosis is recommended and for those with no other explanation for recurrent stroke. In patients of polycythemia, transient, acute conditions such as dehydration, alcohol intake, and others may contribute importantly in synergy with other mechanisms and lead to development of a hypercoagulable state. The early detection and treatment of polycythemia vera as the cause of acute thrombotic complications such as CVST can help guide the further management of the same. It can also be concluded that ophthalmic evaluation should always be conducted in persistent headache emergency. Schaller B, Graf R. Cerebral venous infarction: The pathophysiological concept. Cerebrovasc Dis 2004;18:179-88. Bousser MG, Chiras J, Bories J, Castaigne P. Cerebral venous thrombosis – A review of 38 cases. Stroke 1985;16:199-213. Newton LK. Neurologic complications of polycythemia and their impact on therapy. Oncology (Williston Park) 1990;4:59-64. Tandon R. Parsons' Diseases of the Eye. 22nd ed. New Delhi: Elsevier; 2014. Spivak JL. Polycythemia vera and myeloproliferative diseases. In: Braunwald E, Hauser SL, Fausi AS, Casper DL, editors. Harrison's Principles of Internal Medicine. 15th ed. New York: McGraw-Hill; 2001. p. 702-4. Monagle P, Chan A, Massicotte P, Chalmers E, Michelson AD. Antithrombotic therapy in children: The seventh ACCP conference on antithrombotic and thrombolytic therapy. Chest 2004;126:645S-87S.